The Climate Information Portal (CIP) is a web interface operated by the Climate System Analysis Group (CSAG), at the University of Cape Town, South Africa. The portal, which currently provides climate information for Africa and Asia, integrates climate information into a user-friendly map and graph-based interface. The information comes from a climate database that stores a large suite of observed climate data as well as projections of future climate. There is also an extensive collection of guidance documentation that facilitates the best use of the climate data, its interpretation and, importantly, resultant actions. Further information is available on CIP’s website. CIP emerged out of an earlier project aimed to enable users to easily and effectively access climate change projection information, specifically by exploring a range of scenarios generated by various climate models. This concept was developed out of the growing number of requests received by CSAG for data to support climate-smart decision making. The CIP tool allows users to search and retrieve the data and then explore it visually through a client side application. CIP is available freely via its website – users are requested to create an account so that they may be contacted with regards to changes, improvements and new developments. The majority of the users are from within the NGO and government agency communities of Africa. The target audience includes Local, Provincial and National Government (decision makers), African researchers and students (including non-climate researchers), African agriculturists and the mitigation and adaptation communities in Africa, Asia and around the world. The foundational climate data sets within CIP are the observed climate records and the downscaled GCM projections. The observed climate data sets are sourced from the Global Historical Climate Network (GHCN), the World Meteorological Organisation (WMO) as well as local country meteorological offices. All observed data is freely available to the public through the institutions concerned though local meteorology office data is generally made available through private contacts. The downscaled climate projections are based on the CMIP3 GCM model archive which is also freely available to the public for non-commercial purposes. The downscaled projections are produced locally, through a statistical downscaling method (SOMD) (Hewitson & Crane, 2006) which was developed at CSAG, and the monthly statistics are made freely available through CIP. Daily time scale projections are also available but are generally provided on a contract basis due to the additional data volumes, complexity, and need for interaction with the end user around appropriate application. The table below summarizes the observed and projected climate information provided by CIP. Information is available through easily accessible and interpretable maps and graphs, though users are also able to access the raw data. Importantly all information is provided with accompanying guidance text so that the information can be interpreted in an effective manner. The guidance text guides interpretation and encourages the user to ask questions of the data and explore further information. Table: Observed and projected climate information provided by CIP. CIP is developed, hosted, and maintained solely and entirely by CSAG. CIP is managed by a small team that influences the design, structure, data and information that is organically evolving, based on user needs and feedback, as well as learning through stakeholder involvement. A number of close partnerships have been formed during its development primary with the Stockholm Environment Institute (SEI), UK Climate Impacts Program (UKCIP) and NASA-JPL. Through interaction with a range of stakeholders, the portal has undergone new developments and changes and the continued engagement with user groups and stakeholders will ensure the portal will grow and change as needed. CSAG is a specialized climate research unit with core disciplinary depth in atmospheric science, climate modelling, and applied climate analysis. The statistical downscaling method (SOMD) was developed at CSAG and was applied for projections in both Africa and Asia. These projections form the basis of the data provided through CIP. CSAG also has technical expertise, in-house, for the development and maintenance of the CIP interface which requires advanced computer programming and website development skills. The CIP portal development has been partly funded by a number of different funding agencies. The major funder for the initial development of CIP was the European Union through the United Nations Institute for Training and Research (UNITAR) 3D+ programme, but additional funding has been required to add additional features to CIP. For example, the Climate and Development Knowledge Network (CDKN) have funded the addition of NASA-JPL information into CIP to provide satellite information as part of the ‘observed information’ component. CIP provides output in graphical and raw data format as described above. CIP has been created to be very user friendly and easy to navigate. The level of user expertise across Africa is varied. For some the guidance text is sufficient. The guidance text allows for effective interpretation of the data and encourages users to ask relevant questions of the data, facilitating the best use of the climate data, its interpretation and resultant actions. For others, further capacity building and interactions are needed to more robustly interpret and apply the information taken from CIP. CSAG offers capacity building training in the form of its Winter School course and can also tailor make short courses for interested groups and organisations. CSAG has also launched its e-learning platform that will also help users understand some key concepts and use the CIP information. A key goal in CIP development is to ensure that the portal is available to users and compatible with emerging data sources so as to maximize its value among end-users. The CIP has a strong partnership with the weAdapt knowledge portal, which was developed by the Stockholm Environment Institute and publishes practical examples of adaptation projects. The partnership with weAdapt is only one of many potentially valuable partnerships. To this end the CIP developers have already begun exploring server-side inter-linkages with the South Africa Risk and Vulnerability Atlas and the NASA-JPL satellite data tool. CIP could also as serve as an access portal for the World Climate Research Programme’s (WCRP) new Coordinate Regional Downscaling Experiment (CORDEX) whose primary intent is producing a comprehensive collection of standardized regional downscaling datasets for 12 domains around the world. Both dynamic and statistical downscaling will be performed by a large collection of global modeling groups. Africa has been identified as the priority region and CSAG–University of Cape Town is mandated as the coordinating institution for the African component of the project. While the technical developments are important, the greater challenges lie in the end-users’ engagement with the information provided. The confluence of both statistical and dynamical downscaled data as well as the latest GCM projections from the CMIP5 increases the complexity and potentially the uncertainties presented to the end-user community. This demands keeping in touch with the evolving and increasing requirements of the users across many different user communities. The challenge involves the development of modes of engagement, innovative analysis methods, and rich guidance on best practice usage of the available information. Meanwhile, CORDEX seeks to ensure the utility of the downscaled projections, not only within the modeling community but also in the larger stakeholder communities of policy-making, adaptation, planning, and decision-making. To view the CIP website follow this link. Hewitson, B. C. and R. G. Crane. (2006).Consensus between GCM climate change projections with empirical downscaling: precipitation downscaling over South Africa. International Journal of Climatology, 26, 1315-1337. The South African Risk and Vulnerability Atlas (SARVA) is a platform for global change information transfer from research to policy- and decision-makers. The SARVA program provides a centralised repository for global change research as well as a collection of integration and awareness tools aimed at improving evidence-based decision-making concerning global change. The current focus of the Atlas is on the country, regions and localities of South Africa. However investigations are being carried out to assess expansion opportunities into other parts of the region. Based on a broad stakeholder engagement exercise, SARVA was identified as a necessary resource to address the grand knowledge challenges facing South Africa over the next decade (see DST, 2009). In particular, the Atlas was identified as a tool to facilitate access to the best available knowledge on global change risks and vulnerabilities in South Africa to those that need it most, including local authorities, practitioners, students, businesses and others. As such, SARVA has been identified as a key resource under the National Climate Change Response Strategy as both an input and dissemination tool for relevant assessment and response exercises. Research housed by the portal reflects multiple scales of analysis, from local to national and regional, depending on data origin and availability. SARVA’s open access electronic spatial portal provides internet users with access to spatial and non-spatial data sets and resources, as well as various search, upload/download and data manipulation and presentation capabilities. The portal is organised according to a variety of relevant themes including socio-economics, human settlements, climate and weather, biodiversity, forestry, ground and surface water, disaster management, agriculture, emissions and air quality, coastal and marine and environmental health. In addition to the electronic spatial portal, the platform also has a number of synthesised, targeted and offline products to suit various user needs including a summarised hardcopy compendium of global change research and case studies as well as analysis and awareness tools. Stakeholder outreach and training is a key part of the program, including to officials seeking to integrate global change information into local planning and development processes and others. Electronic Spatial Portal users are able to search for datasets and research according to theme, keywords or geographic area. In addition to downloadable data and research, geographic information available for mapping can be manipulated according the user needs using the portal mapping and analysis functions (see Figures 1). The soon to be launched South African Risk and Vulnerability Atlas Geospatial Analysis Platform (SARV-GAP) provides users with pre-defined maps and interpretations of key risk and vulnerability issues for global change in South Africa (see Figure 2). Multiple stakeholders were involved in identifying the need for SARVA and the key themes it should include. The program also works extensively with key partners at multiple levels such as the National Departments of Environmental Affairs and Cooperative Governance, the South African Local Government Association, municipalities, businesses, academic and research institutions to identify on going needs, build capacity and address integrated research challenges. These include universities, government departments, businesses, municipalities and others. The electronic spatial portal is curated by a number of experts in their respective fields that work to curate the information available on the Atlas and keep up with emerging knowledge and developments in the field. The project management and working group teams for the Atlas are housed at the Natural Resources and Environment Unit at the Council for Scientific and Industrial Research (CSIR) and the infrastructure for the portal is provided by the South African Earth Observation Network. Although general search functions and research outputs such as case studies are available for non-technical audiences, a basic level of GIS training is required for advanced manipulation and interpretation of geospatial data available on the portal. To bridge the gap between technical GIS users and non-technical users interested in gaining a better understanding of global change, the new SARV-GAP tool has been developed to introduce key concepts with no prior technical knowledge or internet connection required. Implementation of the Atlas is currently coordinated by two managers and one project officer based at CSIR NRE. These include a manager leading the electronic spatial portal and theme convenors (~80%), a manager focused on the coordination of partnerships and outreach (<50%) and shared program management functions and; a candidate researcher involved in stakeholder engagement, capacity building and monitoring and evaluation (<50%). All aspects of implementation however are balanced across this team based on available expertise and resource and according to specific plans. The work of the coordination team is supported by a working group devoted to Atlas data integration, product development and outreach activities. Here the coordination team is joined by others with expertise in Geospatial analysis and Geoinformatics, Urban and Regional Planning and other sectors (e.g. Disaster Management, Risk Analysis; Information Architecture) as needed. Another key aspect of the Atlas involves the data and coordination efforts of the theme convenors on the electronic spatial portal. Theme convenors are a group of recognised experts in their respective fields (see above list of themes) who are tasked with leading the acquisition and availability of relevant Atlas data and supplementary support to research and outreach activities. Finally, the South African Earth Observation Network (SAEON) is responsible for the technical development, maintenance and functioning of the electronic spatial portal infrastructure as well as data cataloguing and related functions, while communications support is provided for the overarching Atlas website (which links to the electronic spatial portal) newsletters and other communications. The annual budget for the Atlas is between approximately 4-6 million South African Rand (ZAR) per annum (approximately half a million USD). SARVA products including the hardcopy Atlas, the electronic spatial portal and others have been well received by local and international audiences, in particular for bringing the multiple stressors and vulnerabilities of global change to local and international audiences of all kinds. The Atlas has been used by South African parliamentary members and policy makers around global change, by scientists and analysts assessing risk and vulnerability and by officials and others planning responses to the multiple stressors and vulnerabilities facing the country today and into the future. The Atlas has also been targeted for possible expansion at a regional level. Hardcopy of the Atlas: Archer, E. (ed.) 2010. The South African Risk and Vulnerability Atlas. Faccer, K. & Mambo, J. (eds.) forthcoming. The South African Risk and Vulnerability Atlas, 2nd edition. Department of Environmental Affairs. 2012. National Climate Change Response Policy. Department of Science and Technology (DST), 2009. 10-Year Global Change Research Plan for South Africa. In Tunisia, as part of the cooperation framework between the Ministry of Environment (ME) and the projects ‘Support for the Implementation of the United Nations’ Framework Convention on Climate Change’ (CCC/GIZ) and ‘Inventory of Methods of Adaptation to Climate Change’ (IMACC), the first steps towards setting up a cataloguing tool for the metadata required for climate change adaptation (CCA) have been taken. This tool enables the indexing, structuring and description of resources so that they can easily be found and consulted. The listing of metadata (the grouping of mainly geographical information which describes physical or digital resources) enables information sharing and interoperability, while integrating the rights and conditions of utilisation. The starting point is the conclusion drawn at national level based on vulnerability analyses, and/or the application of other CCA methods which showed the need for a variety of data – mainly climatic – and the constraints of localisation and access to these data. The Ministry of Environment, the Ministry of Agriculture and the National Meteorology Institute have already expressed their interest in setting up a catalogue of metadata. The vulnerability analysis carried out on the olive oil sector in the region of Médenine served as a case study to identify needs in terms of data (format, localisation, access). The process was carried out in close consultation with the data providers concerned. Phase 2 of the discussions with the actors was carried out at a workshop presenting the outcome of the study and allowing for exchanges on the advantages, requirements (mainly standards) and constraints involved in setting up data cataloguing tools. Bilateral contacts took place with the institutions that wished to enlist their data/information. The choice was made of a cataloguing portal ‘géocatalogueG3CTN’, that operates with the open source software ‘Geonetwork’ (for technical details see references). 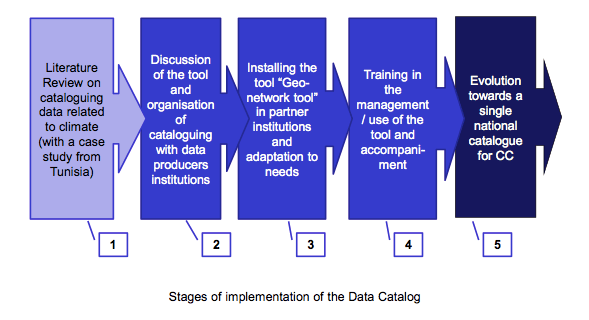 At present five institutions are at the stage of installing the tool (stage 3). Other institutions are likely to join the experience, particularly within the Ministry of Agriculture. In this transition phase, there will be one common database on the same server (of the Ministry of Environment, hosted at the Tunisian Internet agency – ATI) but each institution will have its own application and shall be responsible for the management of its geographic metadata as well as any additional descriptive documents that it wishes to share. Each institution is given coaching in order to master the tool, make the required adaptations on the basis of information that it will put online, choose the adequate standards, and organise its catalogue management. The initiative leader is the ME. The current participating institutions are the ME itself (with its management structures), three organisations under its umbrella (the Tunisian Observatory for Environment and Sustainable Development, the National Agency for the Protection of the Environment and the Agency for Coastline Protection and Planning), the Forestry Directorate General (Ministry of Agriculture) and the National Meteorological Institute. The catalogue could be used by the actors in charge of drafting development projects (public sector and NGOs) and integrating CC and research institutions. The CCC/GIZ project plays a mobilising role for data providers and acts as a catalyst. A Tunisian design firm has been hired to manage the installation and coaching for the adaptation and management of the cataloguing tool. The selected software meets international standards and has been widely adopted, particularly by United Nations organisations such as the FAO. In addition, it has the advantage of being ‘open source’. The software is easy to manipulate (with user-friendly and intuitive interfaces) and its technical control conditions come at a reasonable cost. At present, the programme is limited to the installation of the cataloguing tool in five institutions. The final product expected in the medium term would be a national catalogue, which would collect data from all organisations providing relevant information on CC. The installation of the tool and its use require expertise that is available in firms specialised in computer science and information systems, as well as a brief training of its managers. The main factor in operationalizing such an initiative is the adoption of an approach involving regular and progressive consultation among the actors, in addition to the sharing of data among institutions, which is often a delicate issue. The challenge also remains institutional and organisational (i.e. human resources). The institution will have to designate a person in charge of updating and managing the catalogue and the information that should be regularly collected and documented. The process is still underway but initial results demonstrate the benefit of such an approach in facilitating access to the required data for the analysis/diagnosis of vulnerability and the identification of CCA measures. In addition to the installation of the tool, in the short term, a pool of ‘web managers’ will be created, qualified to manage this type of catalogue. In this respect, the added value is substantial in terms of identifying existing provision in the field of information, data localisation and reduction of data dispersion. The setting up of the tool requires reasonable national expertise costs. The software is open source and around four months would be required to set up the catalogues. The efforts involved in standardising the catalogues are however more time-consuming. This potential is primarily based on the fact that the need for data identification and localisation is largely felt by those actors who are involved in the CC study and in the resulting adaptation measures. Other institutions have also expressed an interest in being part of this cataloguing initiative (particularly within the Ministry of Agriculture). Resorting to metadata bases and catalogues has become increasingly necessary, and is evolving at various levels. In Tunisia, the Prime Minister’s Office has launched a portal for open source initiatives and would be interested in setting up such a cataloguing tool. It is vital to clarify that metadata cataloguing be transparent regarding the nature, localisation (who holds the data and under what form) and conditions of acquisition. There can be no direct access to the data (unless approved by the institution). Access conditions are currently subject to the goodwill of institutions, which can sometimes be a limiting factor. At a later stage, officers from the institutions in charge of catalogue management might be added.